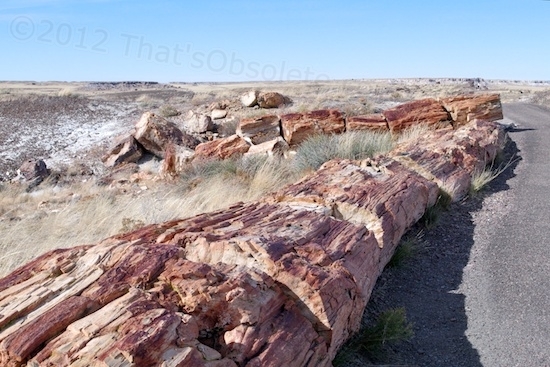 The Crystal Forest area of the Petrified Forest National Park is not the only one containing petrified logs, but it is the best and the most accessible one. 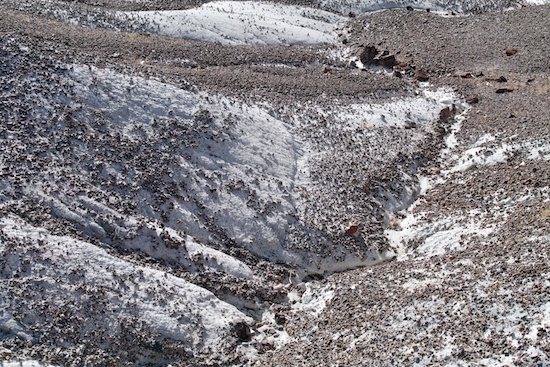 There is a narrow paved path looping through it. I think the pictures say it all, but experiencing the Crystal Forest in person puts in on an entirely different level. 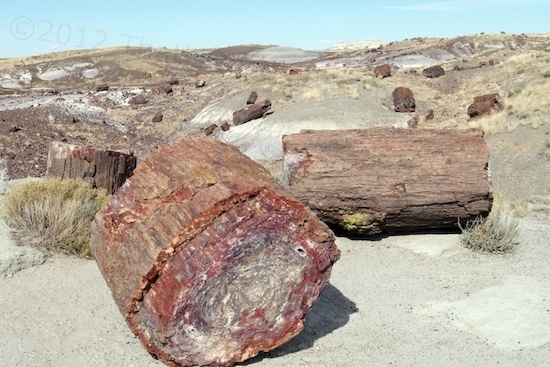 The theory is that a huge area of water flow through a primordial forest eventually caused a vast logjam to accumulate, and this is the end result. This looks like a shot down into a distant valley, but it’s actually just the ground below my feet. Actually, it’s only a portion of the end result. 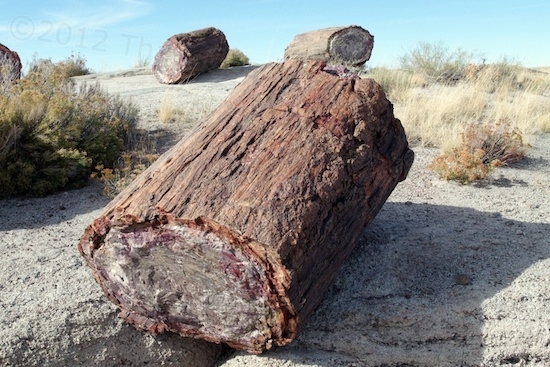 In 1853, a military surveyor arrived and wrote that one of the tree trunks “measured ten feet in diameter”. That’s long gone. 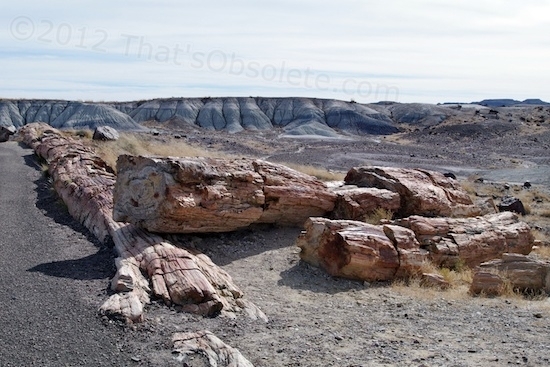 A steady stream of visitors and commercial interests have looted the park of a large portion of its petrified wood and archeological artifacts since the last half of the 1800s, and I don’t mean just pocketing pebbles, which is still a problem. I’m talking cranes and wagons. 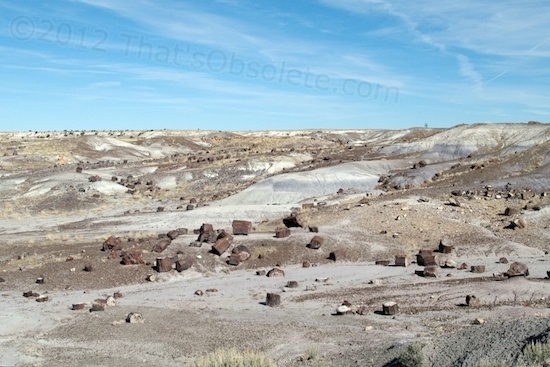 You can still view bits of the aftermath at commercial yards in the area. 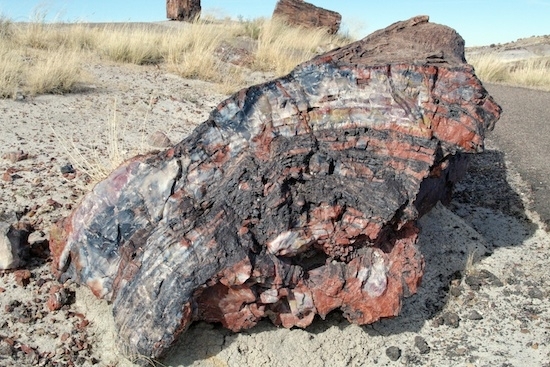 People just felt that it was inexhaustible and there for the taking, a perception that is still pervasive today on the topic of natural resources. 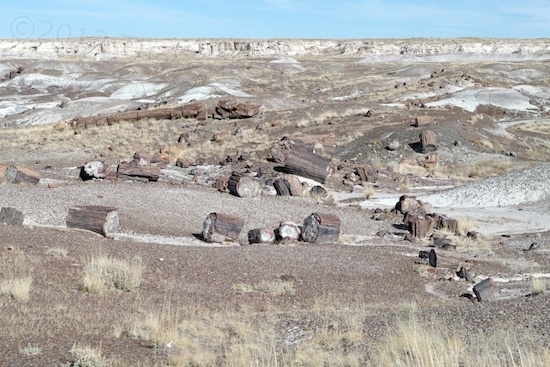 By 1895, Arizona’s Territorial Legislature became afraid that the wholesale looting would leave nothing, and petitioned Congress for national park status. They were ignored. 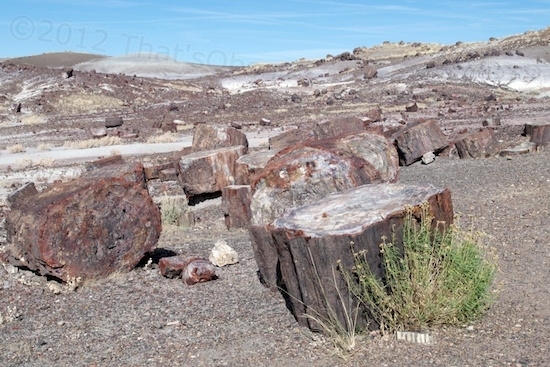 President Theodore Roosevelt signed the Antiquities Act of 1906, designed to protect the petrified forest area as a national monument. 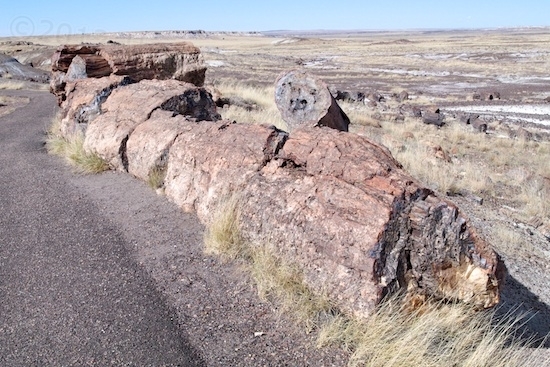 Though a roadway and the Desert Inn were worked on by the Civilian Conservation Corps throughout the 1930s, it wasn’t made a national park until 1962. It’s hard for me to imagine a stranger place on earth. From what I gather, visitor looting without any sense of guilt continued to at least 1950, and each visitor today is given a bright green card at the entry gate outlining four things that it is now illegal to do in the park, with specific penalties. The back of the card is to be used for noting violations, and upon departure, each visitor is asked about whether any items were taken. It’s ineffective, but it shows that our societal and technological sophistication doesn’t trickle down to our basic human natures. When push comes to shove, we still have great difficulty thinking past individual self and this moment, don’t we? 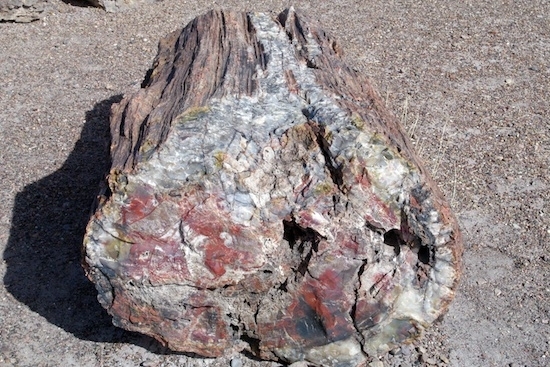 Fortunately, there’s still enough petrified wood around to amuse and inspire. 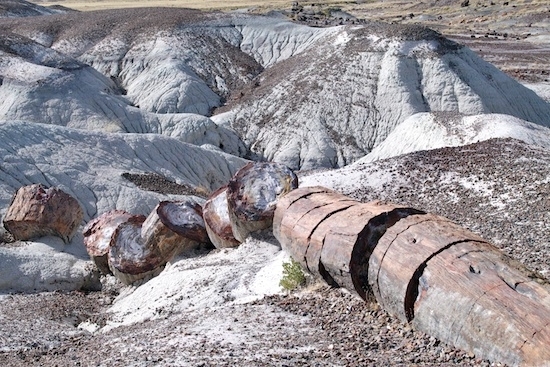 The petrified logs were originally all buried, and erosion has slowly exposed them. 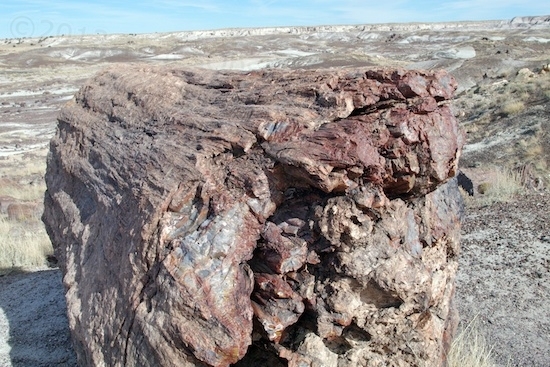 In fact, a few can be found perched high on pedestals of much softer rock. 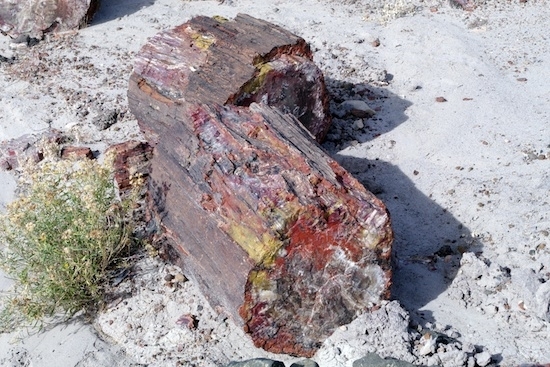 When the supporting material eventually erodes away, the log falls to the new ground level. 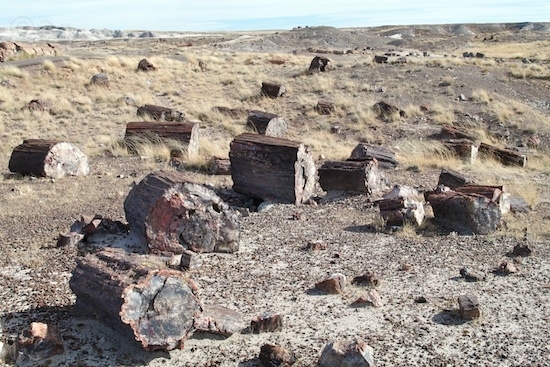 Some logs can be seen just peeking out of the ground. 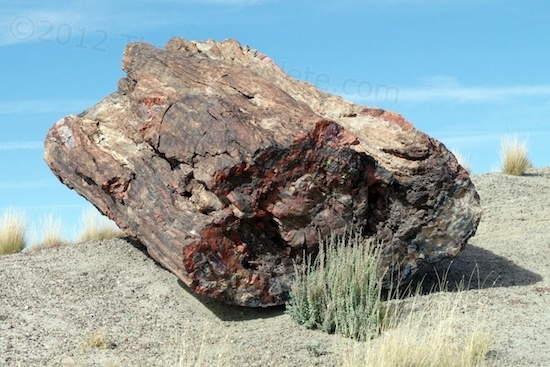 If the log gets exposed on the side of a hill, it will tumble down to the bottom once it is freed. 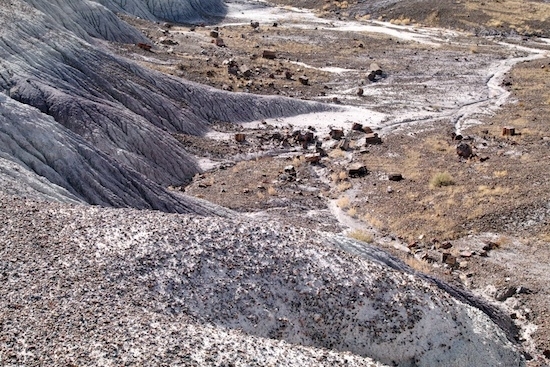 In such an arid climate, one might imagine that this exposure process would take forever, but one ranger told me that the nearby section called Blue Mesa loses about a quarter inch of surface a year! 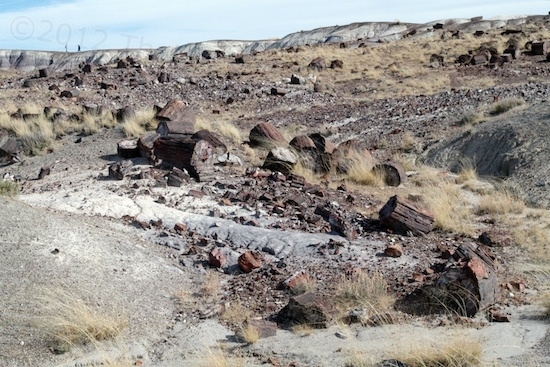 One look at the washes throughout the area makes it plain that each year brings new changes. The ground here just doesn’t seem to absorb much water, so it flows rapidly to lower levels and takes what it can with it. Wow this is an amazing place!! 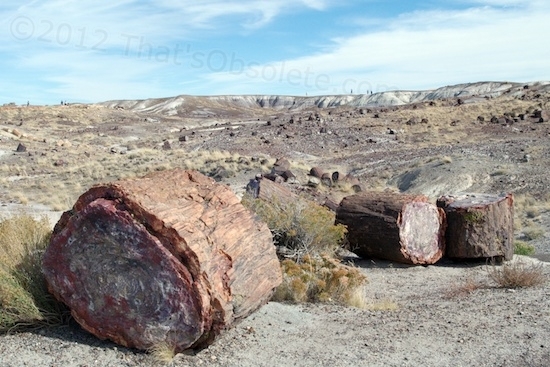 i would love to be able to visit it someday!! I spent most of a week in this park, and just half a year later, I’m certain that I’ll swing by again someday. hey, thanks for the link to this post of yours. And hey, they let you take dogs in! Another one for the travel file.